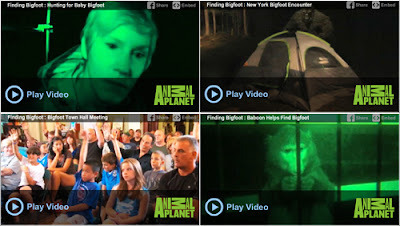 The highlight of tonight's Animal Planet Season 2 Premier of Finding Bigfoot will be the investigation of the New York baby Bigfoot. The footage was shot in 1996 by Doug Pridgen. As you can see in the video below, it appears to show a small creature swinging from branch to branch. An escaped primate or baby Bigfoot? The rest of the videos below are previews from tonight's (01/01/2012) episode titled "Baby Bigfoot"
I find it very possible that these creatures are out but have concerns if found harm would come to these creatures also. Not sure if I would tell anyone about it.